This summer I been busy cheating on my two first loves (baking and cooking) with my new crush: canning. It’s an obsession. Anytime I see fresh fruit at the farmers market or at the store I think that this summer is going to pass me by and I will lose the chance to preserve all the gorgeous seasonal fruit. I grew up watching my grandmother make huge batches of deeply spiced mango chutney with cashews and raisins. My job would be to stand on a little stool and carefully stir the bubbling mango mixture. You want to know a secret? I hated mango chutney then. Maybe it had to do with the fact that I had to stand there and help mix batch after batch after batch for a whole day. It was not until recently that I started experimenting with jam making. I’ve been reading everything I can get my hands on, I started with Ball’s Blue Book of canning which really goes over the basics. I also took a class with Mrs. Wheelbarrow, where I learned fun tips and tricks. I always thought that the process of canning was really intimidating and that you needed a lot of special equipment, but the truth is that it is quite simple. This is a really easy recipe to try. 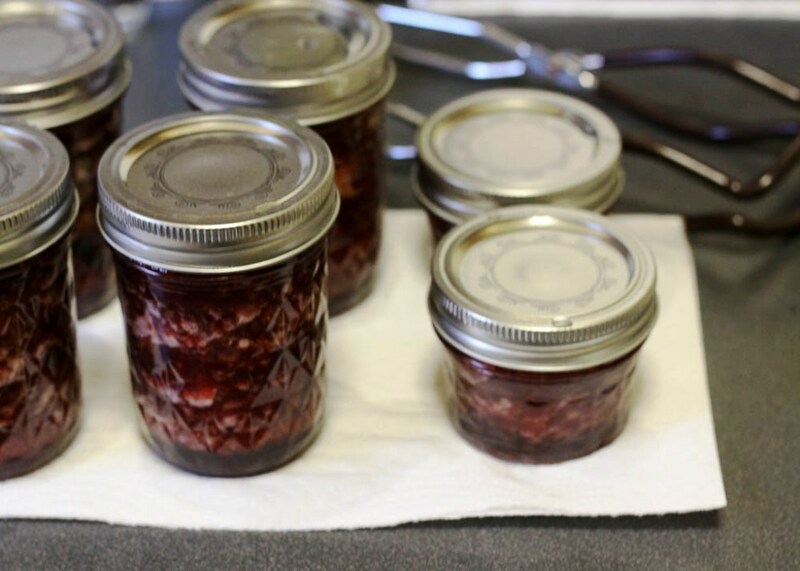 And if you don’t want to deal with the water bath canning process, just put the jam in sterilized jars, let them cool for 30 minutes, and refrigerate. The best part about this is that strawberries go on sale often. You need ripe but firm strawberries that are very fragrant. 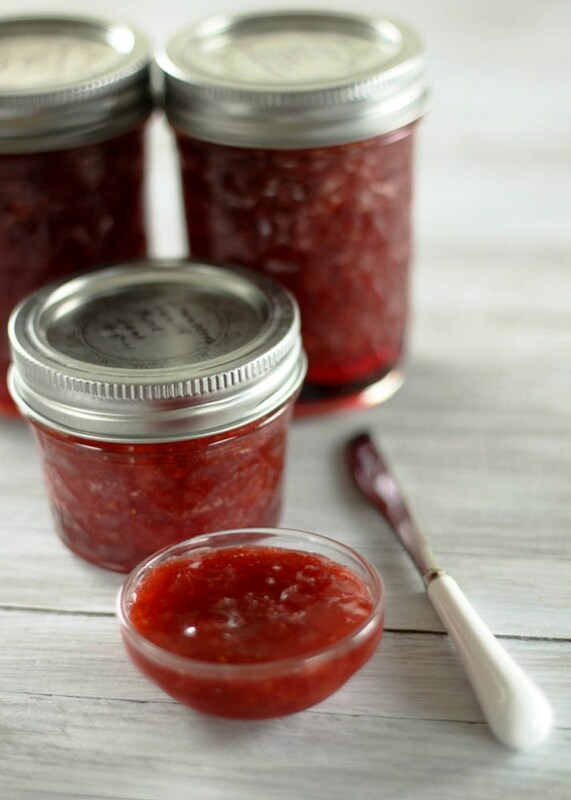 But don’t get berries that are over ripe, they will give your jam a funny smell. I hope you try this recipe. 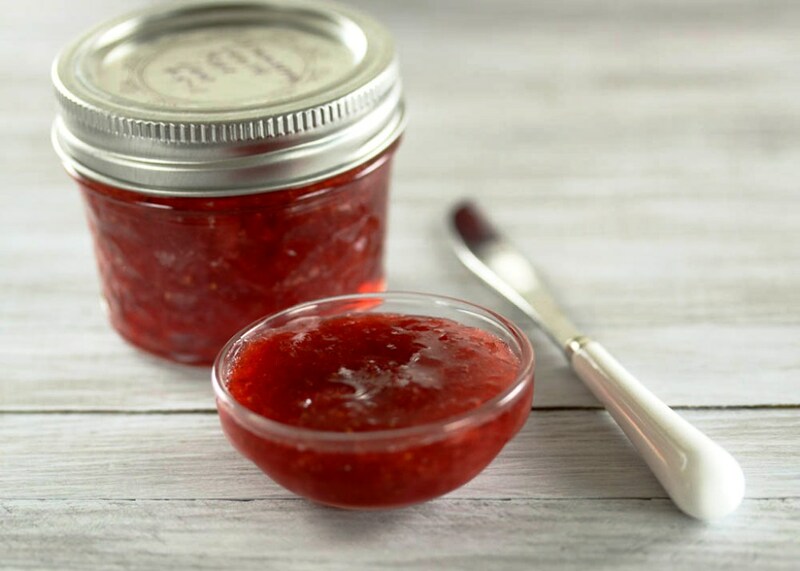 The jam is soft and spreadable with a really concentrated strawberry flavor and the delicate fragrance of vanilla and rose. So far I’ve made 6 batches because I keep giving it away as gifts and I need to make sure I have enough to last me until next summer! 1. Prepare jars by placing them in a water bath or running them through the short cycle in your dishwasher with heated dry on. Place lids and rings in a small saucepan with simmering water. 2. Place a small plate in the freezer. 3. Wash, dry, and hull strawberries. Cut them into 4 pieces. Scrape seeds from the vanilla bean and place in a bowl. Add strawberries, sugar, and lemon. Mix well and let sit for 1 hour. Transfer to a wide pot (5-7 quart capacity), and bring to a boil over medium high heat. Once the mixture reaches boiling point, reduce the heat to medium. Once the sugar dissolves the mixture will be watery. In 20-45 minutes the mixture will start to thicken. About halfway through the cooking time, use a metal potato masher or a large spoon and carefully mash some of the fruit. That way you will get different textures in your jam. I like to mash most of it and leave just a few pieces whole. Skim the jam of any foam that forms around the edges during the cooking process (I don’t really bother with this too much). 4. 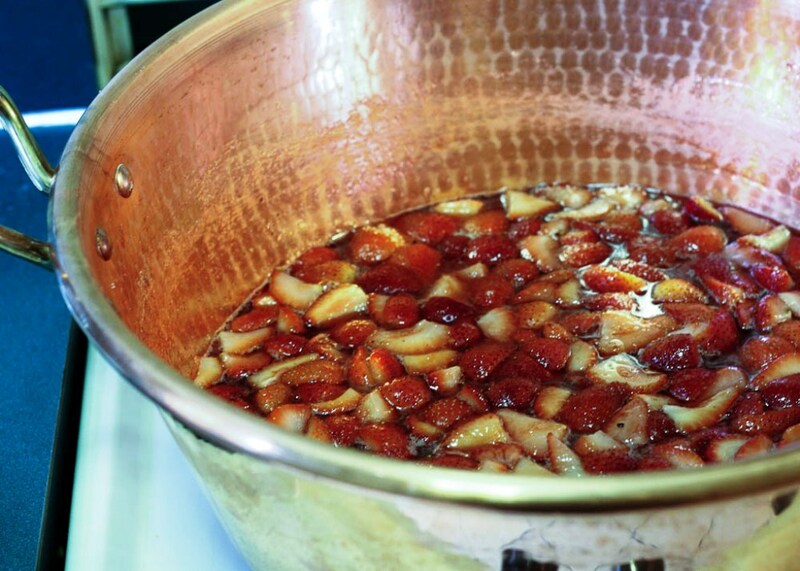 When the mixture starts to thicken, reduce the heat to the lowest setting, and test the jam for doneness. Put about half a teaspoon of jam on the plate, and return it to the freezer for 1 minute. Take it out and if the jam wrinkles then it has reached the gelling point. 5. Once the jam reaches the gelling point, bring the mixture back to a boil, add the rose extract and stir well, and turn the heat off. 6. Ladle jam into jars with the help of a funnel. Remove the vanilla bean pieces and use them as decoration in some of the jars. Fill one jar, place the lid on and tighten the band only with your fingertips. Repeat with other jars. Process in a boiling water bath for 10 minutes. Remove jars from water bath and let them sit undisturbed overnight. Makes 6 half pints. you know my thoughts on the rose water…. 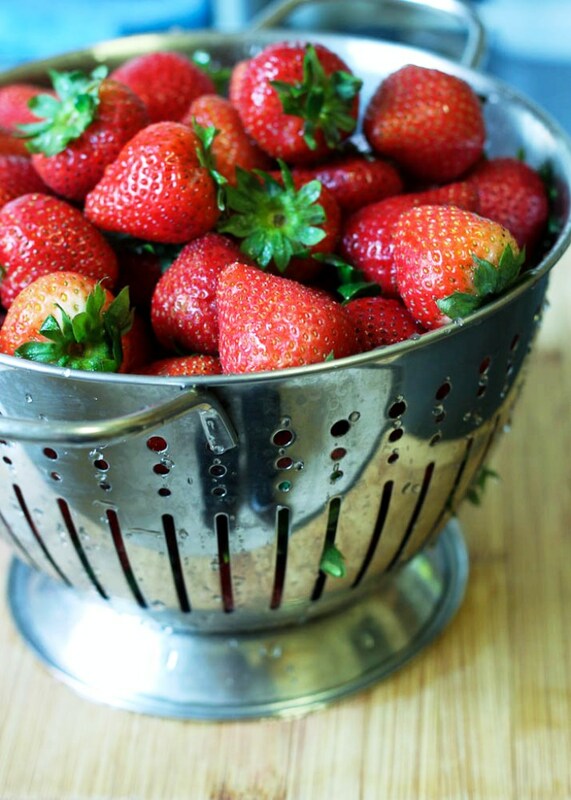 love the photo of strawberries in the colander: just want to reach in and take a few. can’t wait to try your plum jam! This looks delightful! Thank you for sharing and beautiful photos!